Background: Fiber reinforced ceramic matrix composites are developed to improve the mechanical properties as well as to decrease the crack propagation and brittleness of monolithic ceramics. 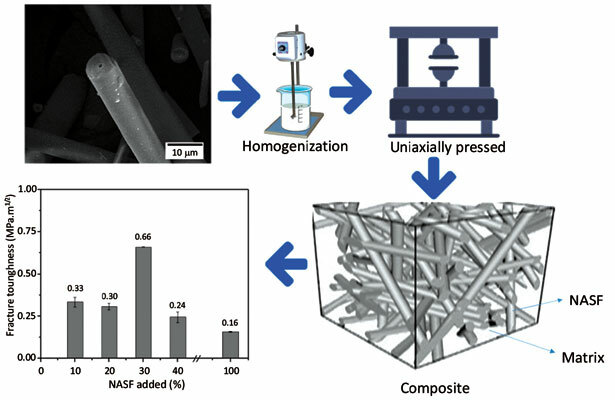 Objective: In this work, natural amorphous silica fibers and amorphous colloidal silica were used to obtain fiber reinforced ceramic matrix composites. Method: Initially, a small fraction of natural amorphous silica fibers was milled to reduce the particles size distribution to reach an intermediate size between natural amorphous silica fibers and amorphous colloidal silica. Subsequently, compositions containing 10 to 40 wt% of natural amorphous silica fibers were homogenized, uniaxially pressed (100 MPa), dried and fired at different temperatures (1000, 1100 and 1200°C, 10°C/min) in an oxidant atmosphere. Furthermore, the obtained composites samples were characterized according to their physical, thermal, structural, microstructural and mechanical properties. Results: SEM analysis showed that natural amorphous silica fibers are characterized by an acicular shape with aspect ratio, L/D = 18 ± 1.2. The obtained composites have shown relatively strong interfacial bond between matrix and fibers. However, the results suggest enough interfacial adhesion between fibers and matrix for composites containing 30% of natural amorphous silica fibers. Moreover, they exhibit a low coefficient of thermal expansion (0.63 x 10-6°C-1), an appropriated relative density and a significant increase (45%) in fracture toughness. Conclusion: The composites produced are promising materials for a wide range of advanced engineering applications, remarkably in the building industry, machinery, aviation industry, and architecture. Natural amorphous silica fibers, colloidal silica, ceramic matrix composites, fracture toughness, crack propagation, monolithic ceramics.